I want to take the readers back in time, Billions of light years away, to an instant, when the Big bang had just created the Universe. Immediately after this, the first particles that formed were entirely mass-less and zipped around the fledgling universe at the speed of light. But a trillionth of a second later, something happened and scores of particles acquired a mass, which led to formation of basic sub atomic particles like quarks and electrons that make up atoms.But what was it that made this conversion possible from energy to mass? Scientists have been looking for a satisfactory answer for this riddle a long time. We all know from school level physics that energy can be derived from mass, e.g. burning wood. We also know the principle of conservation of energy. Later, Albert Einstein gave us the empirical relationship with which mass can be converted into energy. But all this was like describing only half the picture, no one knew how energy gets converted into mass. On a cosmic scale we know that black holes devour huge and massive stars and planets and let out energy bursts but no one could tell how stars are born from no where. Then in 1960's, a Scottish physicist, Peter Higgs, predicted an invisible field that is all around us – and even within us, that could be giving mass to the basic constituents of atoms. His theory written in pencil on a pad of paper, also suggested possibility of an another particle, by exchange of which, basic constituents of atoms might be acquiring their masses. This Higgs energy field ensures that the universe is not an ocean of mass-less particles hurtling around at the speed of light, as it was at the time of creation. In the generally accepted theory of sub atomic particles and forces, it is believed that the sub atomic particles exert forces on each other by exchanging a class of particles called Bosons (Named after famous Indian scientist Bose. ), which have a mass and also Photons, which have no mass. Bosons also are constituents of the list of the Fundamental particles. These 12 particles and four basic forces are now considered as The Standard Model in Physics. Extending this theory, Peter Higgs thought of a new particle now known as Higgs Boson, that forms the mechanism by which all pervading Higgs energy field around us, gives mass to sub atomic particles by exchange of this Boson. 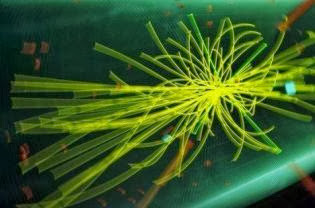 With Higgs theory, now it was possible to predict what must have happened a trillionth of a second after the Big Bang. At this point of time, the Higgs energy field got somehow switched on and the whole process of creating particles with mass began in the Universe. However, any theory in physics remains just a theory on paper, unless it can be proved by an experiment. It would be obvious to anyone that since Higgs Boson transfers mass from energy field to a particle, it must exist for a tiniest interval of time before destroying itself in form of Photons. That is why even though it is around all the time since Big bang, it had been almost impossible to physically detect it's presence. A facility was built by European Centre for Nuclear Research (CERN) in 1970. This facility, built at the cost of $ 10 Billion near Swiss-French border, known as Large Hadron Collider, actually is an atom smasher, which creates high-energy collisions of protons to investigate dark matter, anti-matter and the creation of the universe, which many theorise occurred in a massive explosion known as the Big Bang. On the morning of 4 July, 2013, CERN revealed in a seminar for the first time that they had indeed discovered the Higgs boson. The news, though anticipated and expected, so much overwhelmed the audience that they got to their feet with thunderous applause. Weeks later, Peter Higgs dabbed his eyes with his handkerchief, watching a video of this very moment. He explained his reaction. "I was about to burst into tears, I was knocked over by the wave of the reaction of the audience. Up until then I was holding back emotionally, but when the audience reacted I couldn't hold back any more. That's the only way I can explain it." He was so emotional not because CERN had finally proved his theory right, but for what the discovery meant to those around him. This week, 84 year Peter Higgs, along with the Belgian theorist, François Englert was awarded the Noble prize for Physics, worth 8 Million Swedish kronor as a huge measure of kudos and recognition of their pioneer work. When the media broke the news, to escape the media spotlight and inevitable rush of journalists, the reclusive scientist just disappeared off on holiday without a mobile phone. In his normal life style also, Peter Higs is illusive to the core. He has no computer, and no email. He answers the phone only when he knows who is calling. 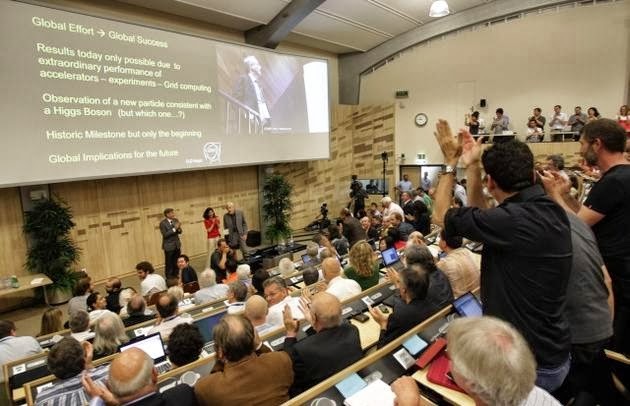 His close friends and fellow physicists at Edinburgh University, celebrated the award of Noble prize after watching the announcement from Stockholm online at the Higgs Centre for Theoretical Physics. Peter Higgs however was absent. Much later, Edinburgh University, released a statement in which the physicist said that he was overwhelmed to receive the award and added "I hope this recognition of fundamental science will help raise awareness of the value of blue-sky research." Ben Allanach, a theoretical physicist at Cambridge University says: "I cannot over-stress the importance of the discovery. The mass mechanism that the Higgs boson is a signal for has had a huge impact on particle physics over the last 50 years. I think many of us felt that it had to be correct, although we were willing to let data dissuade us." Very true! 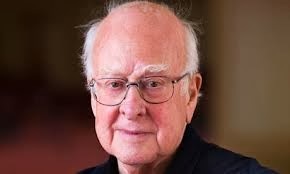 Peter Higgs, the reclusive theoretical physicist, has no doubt made a tremendous contribution that has helped the mankind to understand a little more of the riddle that is called the Universe. However he has proved to be as illusive as the Goddamn Particle itself, whose presence he had predicted in 1960's.